The following notes will hopefully help anyone thinking of building this or something similar. 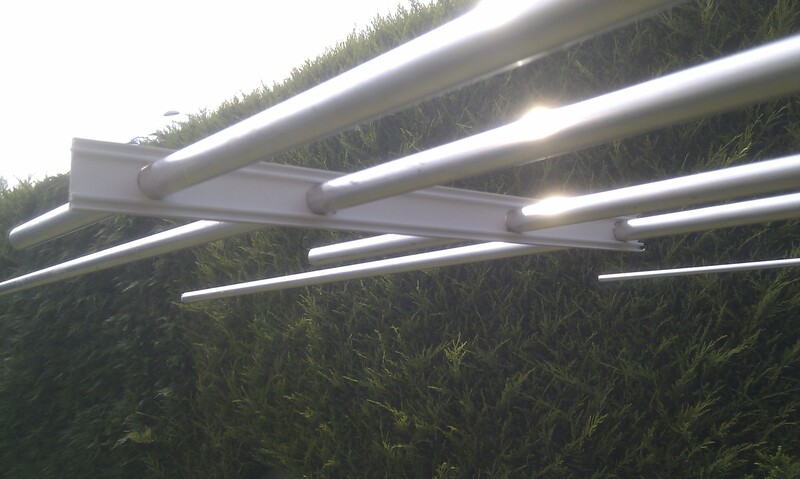 The all-important element clamps can also be sourced from Aerial-parts of Colchester, as can the mast to boom clamp which needs to be specially ordered for this yagi as there’s not a lot of space between the D1 and DE elements. Fasteners are all stainless steel and I sourced them all from eBay – again volume buy helps keep costs down. 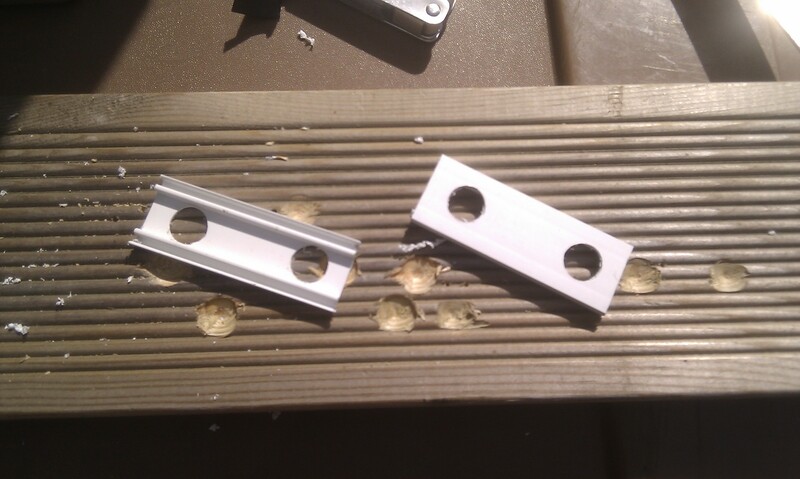 The plate for mounting the DE was made from some scrap 3mm aluminium sheet I had available. I used a plumber’s copper pipe tube-cutter to cut the round aluminium tube. I find it more accurate and better than using a hack saw. I chose to mount the yagi with the elements hung below the boom, this then allows the balun to also hang below and you then do not need to drill a hole in the boom to allow the coax to pass through – it’s also easier in the future to dismantle the antenna / change the cable. A tip given to me by another local was to use spacers on the back 6 elements. 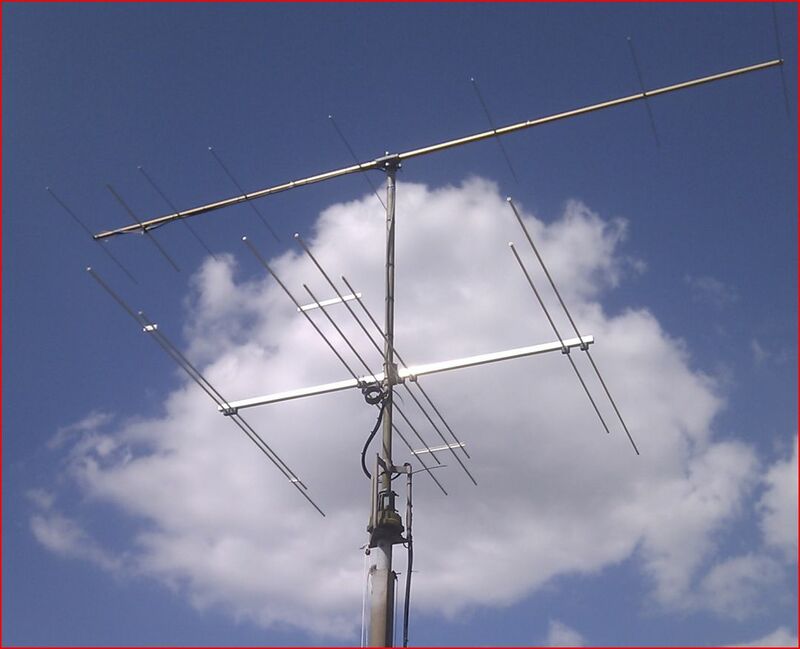 Due to the different element lengths and the way the interlaced yagi works people have noticed that the SWR can vary due to the element spacing changing in strong winds. I looked at many different things to find something suitable in the end I found the snap-on cover used on small rectangular cable conduit was ideal in size and weight so I used this to produce four spacers which can be seen in the photo below. I should add I have no idea of the UV properties or longevity of this solution. In summary the construction was very easy and can be done with what I would consider to be the average DIY tool kit. 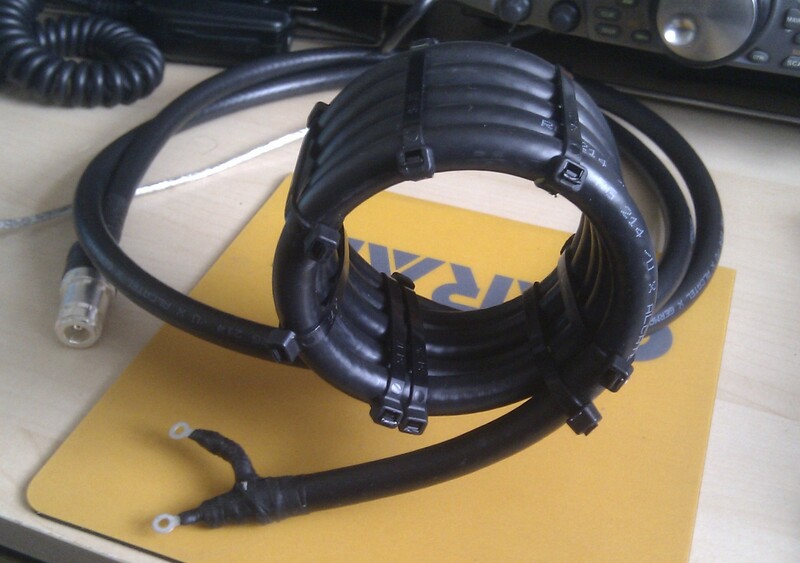 The hardest part was making the choke balun – I am not kidding… I used RG-214 and trying to wind five turns of that while keeping the cable-ties in place and then cable-tying it all together single handed is not easy. Once again Justin has some good instructions on his web site on how to wind a choke balun. I hope to publish some SWR graphs of the antenna in the future…. Update: I have had an opportunity to use an MFJ-259 SWR Analyser to run a few very quick tests on the antenna. The results showed a good match on 6m, on 4m resonance was right at the bottom of the band (ideal for DL band plan 🙂 ) and on 70.200 MHz the SWR was measured at 1.5:1 I believe this “shift” is due to adding the PVC strips. More time is needed for further investigation… and for me to invest in some new test gear! I should also add that I have no business association with any of the companies listed other than being a satisfied customer.